Pictured is the northern portion of Hogback Road that winds through a large wooded area just south of Kilbourne Road and to the east of Alum Creek Lake. Located near Interstate 71 in Delaware County, the road has long been thought to be home to paranormal activity and is mentioned on various websites dedicated to haunted places. Between the City of Delaware and the Village of Sunbury lies Hogback Road — a scenic stretch of secluded roadway just west of Interstate 71 that winds through a wooded area as it runs north and south along Alum Creek Lake. 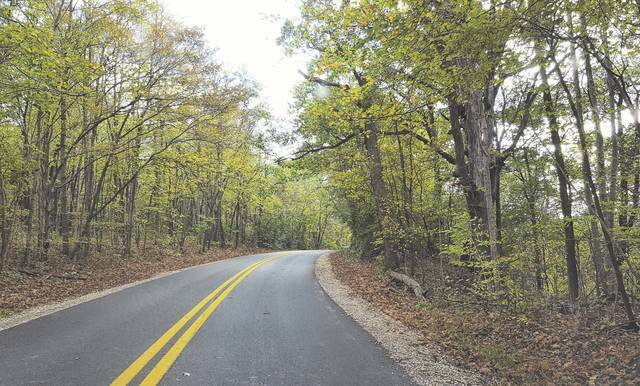 There is, however, more than meets the eye to this particular road, as for decades, rumors have swirled among some locals and paranormal enthusiasts who contend that Hogback Road is haunted. Websites for the the Ohio Exploration Society and Ohio Haunted Places both mention the road, specifically accounts of a haunted residence along the road near an old Indian burial ground. The websites note a transparent apparition with an Indian-like headdress has been spotted in the home, which left behind a cold chill as it entered through one wall and exited through another. A group known as Paranormal Fanatics of Ohio (PFO) also dedicates a section of its website (pfo.weebly.com) to Hogback Road, which it visited several years ago after hearing from area ghost hunters about paranormal activity in the area. Having heard countless rumors over the years about urban legends and paranormal activities tied to Hogback Road, Delaware native Dustin Reichert, 21, had to experience the famed stretch of roadway for himself. Some of the most memorable encounters, Reichert said, have involved car doors opening with no one in sight; claw marks/finger marks appearing on his car windows and rear view mirror; and what sounded like rocks being thrown at the guardrail. The majority of the presences Reichert has encountered he believes are “good spirits,” but he cautions there are places on Hogback Road, especially in the thick spots of the tree lines, where “evil” spirits like to linger. “I’ve experienced some presences that were never there to harm anyone, but I have also seen a demon as well,” he said. To help document some of his encounters, Reichert and his late friend, Tyler Hobby, who passed away in 2016, started Ohio Ghost Production, an amateur production company that films suspected haunted places. Several of the duo’s encounters on Hogback Road can be viewed by searching “Hogback Road Delaware Ohio” on YouTube. Through the Ohio Ghost Production YouTube and Facebook pages, Reichert has heard from those who believe in paranormal activity on Hogback Road and those who don’t. For instance, one woman contacted him on Facebook about seeing a floating lantern along the roadway. “She found it to be exhilarating,” he said. In the same comments section, another YouTube user writes the rumors of paranormal activity along the road are just that, rumors that were started “to play a prank” on local youth.